The Antares rocket first stage ascends the ramp leading to the pad at Wallops Island. 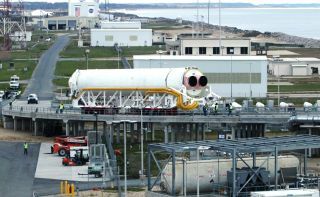 PARIS — Satellite and rocket builder Orbital Sciences Corp. on July 19 said its Antares rocket had encountered six or seven weeks of developmental delays and will not conduct its inaugural demonstration flight until late September or early October, with a second launch — this time carrying the Cygnus cargo vehicle to the international space station — likely in mid-December. Dulles, Va.-based Orbital also said it spent $2.1 million in the three months ending June 30 on legal and other professional services fees related to a major acquisition that ultimately was not consummated because it was too expensive. In a conference call with investors, Orbital Chief Financial Officer Garrett E. Pierce said the acquisition, had it occurred, "was a major transaction [that] would have had an impact across the company." He declined to say more beyond adding that a purchase only creates value "at the right price." Industry officials had long speculated that Orbital would be in the hunt to purchase Space Systems/Loral, a builder of large telecommunications satellites whose product line has only a few overlaps with Orbital’s commercial satellite business, which specializes in smaller spacecraft. Space Systems/Loral of Palo Alto, Calif., was purchased in late June by MDA Corp. of Canada for about $1.1 billion. In the conference call, Orbital Chief Executive David W. Thompson said the Virginia Commercial Space Flight Authority, which is managing construction of the Antares launch pad at Wallops Island, Va., had encountered "a few unexpected obstacles in recent weeks," pushing the Antares development and qualification schedule into fall. The Antares launch pad, Thompson said, will be certified for operations by Aug. 1 — several weeks later than what Orbital expected in its previous financial update in April. The first stage of the Antares rocket will be placed on the pad for a hot-fire test to occur in late August or early September. About a month later — by early October — the full Antares is scheduled to conduct a demonstration flight without the Cygnus capsule. Thompson said this part of the schedule remained tight, despite the delays, and could still slip further given the program’s current development status. Assuming the hot-fire test and demonstration flight go smoothly and on time, an Antares rocket carrying the Cygnus capsule will be ready for flight by mid-December. Orbital is under contract to NASA to deliver cargo to the international space station under two separate contracts. The first, called the Commercial Orbital Transportation Services, is designed to prove the Antares/Cygnus capability with the demonstration flight and the first Cygnus cargo delivery. This is a cost-sharing contract in which NASA is paying about $188 million, with Orbital contributing a similar amount. Thompson said the Antares and Cygnus development programs have been completed except for their demonstrations on the launch pad. The delays in recent months have been related to the Wallops Island launch complex. Artists' rendering of Antares in flight. Orbital reported that for the three months ending June 30, revenue was up 6 percent, to $371.3 million. The biggest contributor to the increase was the company’s Advanced Space Programs division, which includes the CRS contract. Pierce said an increase of $33 million in CRS revenue from NASA was the main driver of the division’s improved performance, which was up 29 percent compared to the same period a year ago. The company’s Satellites and Space Systems division, which includes government and commercial satellites, reported a 6 percent decline in revenue, to $130.1 million, for the three months ending June 30. Thompson said a decline in revenue from commercial geostationary-orbiting telecommunications satellites, which had been expected, was the main reason for the drop. But if this division’s revenue was down, its operating profit was up substantially, to 8.1 percent of revenue. Orbital delivered two commercial satellites during the quarter, an unusually large output for a company that typically books no more than four such satellites a year. In the case of these two satellites, Thompson said, Orbital had set aside reserves out of concern that the technologies in the satellites, and the terms of the contract, could force Orbital to spend more than expected to complete the work. Orbital is scheduled to deliver two commercial satellites between July and September, but Thompson cautioned that the company is not yet ready to promise another quarter of 8 percent operating margins for its satellite business. Orbital’s Launch Vehicles division, meanwhile, reported revenue of $126.3 million during the quarter, down 5.2 percent because of lower launch vehicle and missile-defense activity. Orbital’s work on NASA’s Gravity and Extreme Magnetism Satellite (GEMS) to study black holes has been stopped following. NASA’s cancellation of the program due to cost growth. Orbital had been under a $40 million contract signed in July 2009, with a launch scheduled for 2015. Thompson said the U.S. Congress may yet order NASA to continue GEMS, but that for now Orbital expects to book $20 million less revenue in the second half of 2012 than it previously expected because of the project’s cancellation. The total impact on Orbital of the cancellation will be a revenue shortfall of about $75 million between now and late 2014, he said. The $75 million figure includes the revenue the company would have booked on the satellite’s construction, plus the fact that Orbital’s Pegasus rocket was to have launched GEMS. Thompson said it will take the company several months to determine whether the loss of GEMS will trigger the retirement of the Pegasus rocket, or whether sufficient demand exists to maintain the vehicle’s production line.